Entrance is not allowed for person below 13 years old without parental guidance. Entrance is not allowed for person below 15 years old without parental guidance. After the devastating events of Avengers: Infinity War (2018), the universe is in ruins. 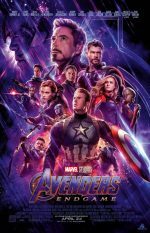 With the help of remaining allies, the Avengers assemble once more in order to undo Thanos’ actions and restore order to the universe. FLIK Cinemas, Lagoona Mall, Doha. Part of the Al Mana Group of Companies.